Pictures of an Exhibitionist Update! 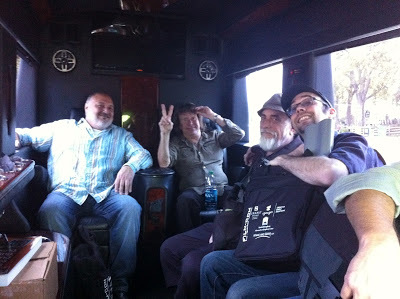 A big thanks to our first "Maestro" Doug Thompson, who also helped us get to the UK for the ELP reunion in 2010. Also thank you to Even Gaarder and Gary Stabb, our latest to take on the "Lucky Man" perk! I'd like to thank everyone who has contributed through IndieGogo to the project so far, so here is the latest Campaign video, and I'll introduce one of the driving forces behind this documentary, my old man / associate producer, David Woodford! 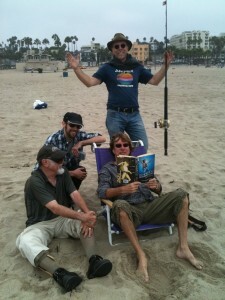 the www.progrockdoc.com website with your friends and help us finish the film! It's been a trying year for the project, after some initial positive vibes from our Nashville appearance, we still have to get a number of interviews and events to shoot in 2013. So we have started an Indie Gogo campaign to help us finish the film. Thanks to CJ Vanston down in LA, we have a place to shoot some of the remaining interviews and potentially some awesome linking sequences with Harry Shearer in June. Then in September, Keith is being honoured with a Lifetime Achievement award in Kentucky. We need your help to get us there and to a cut of the film! Thanks again to everyone who has helped us to get this far... now we are the last stretch. 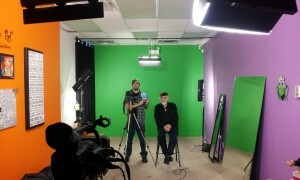 Thanks to Lori Welbourne at On A Brighter Note studios in West Kelowna, we have made a campaign video... more coming in the coming weeks... and thanks to Hans Looman for coming onto the campaign team to work some social media magic with Twitter,Wordpress and QR Codes to name a few! So check out the campaign and join in at whatever level you like, and share among your friends! Prog on. It's been a while since my last blog update, but am now back from Nashville and a great trip to Film-Com 2012. Andy Van Roon and his team of volunteers have much to be congratulated for holding such a stellar event. A unique and excellent idea this event goes from strength to strength each year. Contact cards in hand, had some great discussions in the short time we had there. Myself, my old man and Keith himself attended the film market and took in what we could of such a beautiful city while handing out cards and promoting the project. During our stay we were invited to watch a performance of the Nashville Symphony Orchestra, at the breathtaking Schermerhorn Symphony Center. A truly great experience with conductor Giancarlo Guerrero at the helm. Previous to this we saw some awesome singer/songwriters at Douglas Avenue... all a part of the Film-Com experience! With Harry Shearer (This is Spinal Tap, The Simpsons) providing some voice over work, and more talented individuals offering their services as we come close to finally entering into Post Production... there has been plenty to talk about. We had a highly enjoyable Q and A with Alan Brewer at Belmont University on our last day in Nashville after which there was a flurry of activity to do with the film. We also made a recording of the event, which may become a special feature for the documentary! Time to follow up on some leads and watch this space, as we continue on the road to get Emerson: Pictures of an Exhibitionist completed! A very happy holiday season to everyone, this is going to be my last blog post of the year, as I finish off my summary of the latter part of the years shooting. Last month, we caught up with former Rolling Stones manager and founder of independent label Immediate Records, Andrew Loog Oldham. Lucky enough to catch up with him away from his home in Columbia to the much easier for us to get to Vancouver, we met up with him at at GRB Productions studio, couertesy of Gary Procknow. Well it was easier, but given we were driving from the interior of British Columbia to the coast for about 6 hours in a snow storm, it still felt like a bit of a journey! Once we got there, we were surprised to learn that Andrew had done an interview there for another band's documentary the day before... which was great really as he was already in the zone for the interview process. Armed with our usual interview technique and a handful of questions from Mr Emerson himself, we had an excellent interview... albeit filled with a few holes from the author of auto-biographies called "Stoned" and "2Stoned". In summary, this year has been a very successful year for the documentary with now over 80 hours of footage in the can. The list of interviews has very almost been completely checked off and we have been blessed with all of these talented people volunteering to be a part of this documentary. Now it is time prepare for editing all this footage into a feature length film! After the successful interviews in the UK, I returned to shoot some more hockey games for the Westside Warriors and then it was off to Montreal for about 24 hours. The Montreal shoot we had originally planned to do en-route to the UK, but due to peoples availability, we had to plan it as a separate trip. So, flying solo this time, I took the Red Eye to Montreal via Toronto. The primary reason for this trip was the interview of one of Keith's most famous peers and friends, Keyboard player for Yes, Mr Rick Wakeman, and potentially Yes Front man Jon Anderson. After finding myself a room in the old part of town, above a Mexican restaurant, I contacted my local conspirator, Rod Penway, who was assisting me with these interviews. We managed to wing this interview at the impressive looking Fairmont The Queen Elizabeth in Montreal. A very big thank you to Joanne Papineau and staff for finding us a room for the interview and Glass Onyon PR for setting us up with these interviews. And what a room! 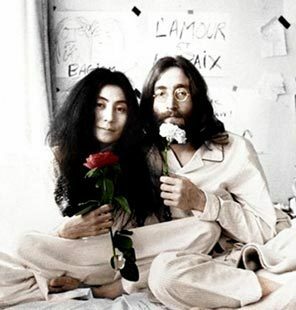 The room was the famous suite that guested John Lennon, who held his famous 'bed-in' in 1969 in Suite 1742, where the song Give Peace a Chance was written and recorded. We didn't even know this until we arrived at the hotel to start setting up! 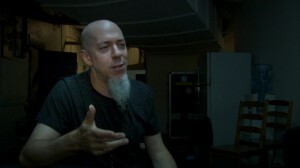 And so it was that we took some shots, and met up with Rick first for his interview. 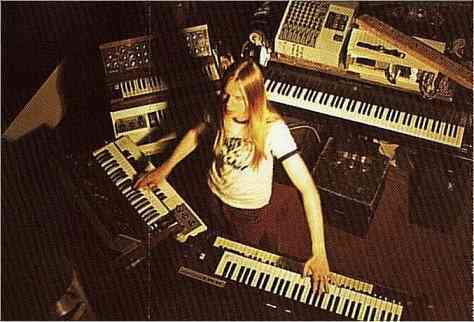 Typically he gave us a lot of great material, as we asked about first his background and then went on to his entanglements with Keith Emerson. Famously Rick reviewed the book "Pictures of an Exhibitionist" for the Gaurdian when it was first released back in 2003. Some great stories, and some fresh leads were gained from the interview, and have to say Rick is a really nice guy... he had another appointment straight after the interview too... so we were very lucky to get him. Jon was a little harder to tie down, but as soon as he heard which room we were doing the interview (himself being a big fan of John Lennon), we managed to get him to sit down with us. Some more great insights of when Yes supported the Nice on tour! One Shepherd's pie and an attempt at sleep later and I was up at 4am to get on the return flight back to Kelowna.... and more hockey games! One last interview to setup, and we are enter the final furlongs of the production phase. Strictly speaking, I should call this post European Interviews : Week Two, as on the Sunday of the first week, I hopped onto a cheap flight to Copenhagen to catch an interview with Keith's ex-wife Elinor Emerson. After interviewing their son's Damon and Aaron back in 2007, I felt it was important to get her into the documentary, so after saving some funds on Transportation (with the Honda $60 special), I managed to jet into Copenhagen Sunday morning and meet Elinor in the centre, not far from the famous Tivoli gardens in the city centre. Elinor was very gracious and told some great stories for the camera. Getting used to the foreign currency, I managed to contrive to spend more on my dinner than on my accommodation (I stayed at a International Hostel not too far from the train station -- great deal!). Sadly the weather was overcast, so all I can say about my first visit to Copenhagen is... I'd love to go there! I was on the plane back to the UK by 6am the next morning... and my lasting impression (at least of the airport) is the Danish really don't want people to sit down! Upon my arrival at Gatwick, I met up again with the rest of the crew and we were heading back into London for an interview with Darius Brubeck (son of the legendary Dave Brubeck). After this interview we were able to follow up with former Gary Farr and the T-bones drummer Brian Walkley, who signed our T-bones picture for us and added some audio to his earlier 2007 interview, as well as catch up with Cristian Van Schuerbeck, who we interviewed in 2010. The next official interview, again in London, was with Keith's good friend and former road manager, Andrew Lane. Wednesday took us due west to the English riviera, to talk with another of Keith's friends and colleagues, British comedian Jim Davidson. Sure enough, it rained the whole time we were there... but thanks to the Grand Hotel in Torquay, who made us feel welcome as we got some hilarious stories and insights from the man and his dealings with E, L and P. Finally we managed to follow the storm cloud back into East Sussex, and caught up once more with Winston Weatherall, who signed the T-bones picture. So now we have the surviving members of Gary Farr and the T-bones that have signed the image. There has been much discussion over who took the photo. The common belief is it was done by KE himself... on a timer! We are looking to put this up on Ebay soon to raise some funds for the film. Thursday was our last full day in England, and it took us and the trusty Honda north of London this time, into the beautiful surrounding countryside. We were going to the Home of Keith's current agents QEDG management to chat with Martin Darvill about the more recent happenings not covered in the book (such as the 40th anniversary reunion). Representing an impressive roster of musicians, we also took the opportunity to interview Keith Emerson Band (UK) guitarist Dave Kilminster and lead singer of Wishbone Ash, Martin Turner. We were so lucky to get those interviews, as Dave had just come back from Europe and was on his way to tour with Roger Waters again. It struck me during his interview how crazy touring is... I feel like I've had a sample of it with the crazy (financially stringent) schedule I myself was having shooting this documentary! Martin Turner managed to answer some questions about what happened when Wishbone Ash supported ELP one year (by playing last!). Then it was back on the plane again back home after a very successful and fruitful trip. Ah, I almost forgot... we got a phone call from a certain drummer just as we got on the plane... more on that later! It has been a very busy time of late with this production, the last few weeks alone has seen us travel across Europe and Canada for the penultimate interviews. This blog entry will update you on the interviews we did in the first week in the UK... which was from Monday 24th October. Thanks to Jeff Allen and everyone at Sensible Music Studios who allowed us to shoot our first two interviews at such short notice... quite literally after stepping off the plane. An epic studio that has been ground zero for some fantastic music! 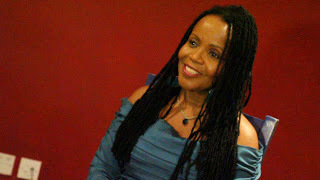 We took the opportunity to secure an interview with Pat Arnold (PP Arnold and the Nice) before she was heading off to Spain and sound engineer Alan O'Duffy who recorded some of the Nice's earlier albums. Coffee at hand, we had a great interview with them both and an awesome way to kick off this part of the journey. No rest for the Jet-lagged though, as we traveled several ways around and through London. Mostly involving the M25. As you know, we are on a seriously tight budget and this is where the Family kicks in... Thanks must go to our Transport Coordinator (Uncle Ray) who gave us his car for the duration of the stay... a Honda that he picked up for about 40 quid. After establishing that there was indeed an engine under the bonnet all I can say is... what a find! I think in the whole trip we paid more than that on congestion fees and parking! First up was the slightly controversial figure of former Nice band member Davey O List, who provided us with a great interview, and a lovely cup of tea. Some great material from the man that we almost didn't get an interview with! Godfrey Salmon, the conductor of the Works Tour back in the early 70's and co-conspirator for some of Keith's early forays in the realm of making music for movies was next along with former Melody Maker and writer of some fantastic prog books, Chris Welch. Chris had a hand in bringing Keith's autobiography to the masses, and again Tea was served all round. A welcome reminder that I was indeed back in England! Finally we finished the first 5 days in another studio, this time Yellow Fish Studios which is a great place out in the wilds of Sussex (near Lewes). For this particular visit we managed to gather four more interviews, as we talked to another former class mate of Keiths (possibly Keith's first techie) and met up once more with the other 2/3 of the Keith Emerson Trio, Jed Armstrong and Godfrey Shephard. We had also managed to track down another original member of Gary Farr and the T-bones, Stu Parkes. Although there were no instruments at hand this time around, we did get some great conversations going, and managed to get Stu to sign a limited edition print of the original Gary Farr and the T-bones, that we have been carrying around on this trip (featuring Stu Parkes, Gary Farr, Brian "Legs" Walkley, Winston Weatherall and of course Keith Emerson). With the exception of the sorely missed Gary Farr, we are trying to get the band to sign it in aid of raising funds to finish filming the documentary. This isn't the picture we're getting signed... usual suspects though! More info. next week, as I reveal the reasons behind a quick trip to Europe... and another packed week of interviews! Still recovering a little after a busy couple of weeks in which we managed 8 interviews and 5 concerts! 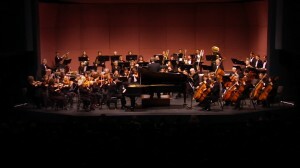 Thank you to Michael Thirkill and Cybele Abbett for making us feel welcome during our stay in Oregon, and congratulations to the Rogue Valley Symphony, who under the class pairing of Martin Majkut (conducting) and Jeffrey Biegel on Piano gave a fantastic start to their season and did justice to Keith Emerson's Piano Concerto #1. Once we hit the road again, it was up to Seattle and we were lucky enough to catch up with Dream Theater's Jordan Rudess before the opening show of their Dramatic Turn of Events Tour. We caught up with Jordan in the backstage area of the vintage Moore Theatre. A great interview and really nice guy too. Needless to say the show rocked! Balancing my clients with the next (and final) stage of interviews now... as we look at a return to the UK to pick up the interviews we missed last year. Stay tuned! After a few days of intensive driving from interior BC to Hollywood California, we have made it to the beach... and soon after stumbled across an avid Keith Emerson fan reading a book and making holes in the sand. Shooting on half a shoe-string budget, on a healthy diet of fast foods and highway hotels... we've managed 5 interviews in the few days we've been here. Thanks to the Rainbow Bar and Grill on Sunset Boulevard, we were able to catch up with former Gary Farr and the Tbones guitarist Cy Langsdon. Our first interview of the trip and crazily we weren't the only crew who got in there that day (a reality tv crew managed to sneak in... but seeing as it was about Food and the Mob... we let it slide...!). Some great stories from Cy, and a great way to kick things off. Next up was Karen McCarthy the daughter of the inventor of Keith's Flying Piano, that he flew on a few occasions in the seventies... most famously at the California Jam. Great stories behind another great friend of Keith. Stories from the road in recent years by catching up with Marc Berthiaume, one of Keith's technicians fishing off of Santa Monica pier. 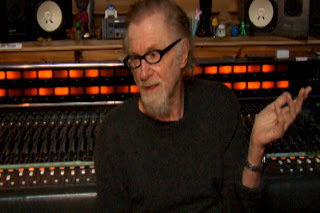 Then finally we set off to CJ Vanston's studio in Studio City, and were lucky enough to interview both him and former Doobie Brothers and Best Guitarist Jeffrey "Skunk" Baxter about their experiences with the Maestro. 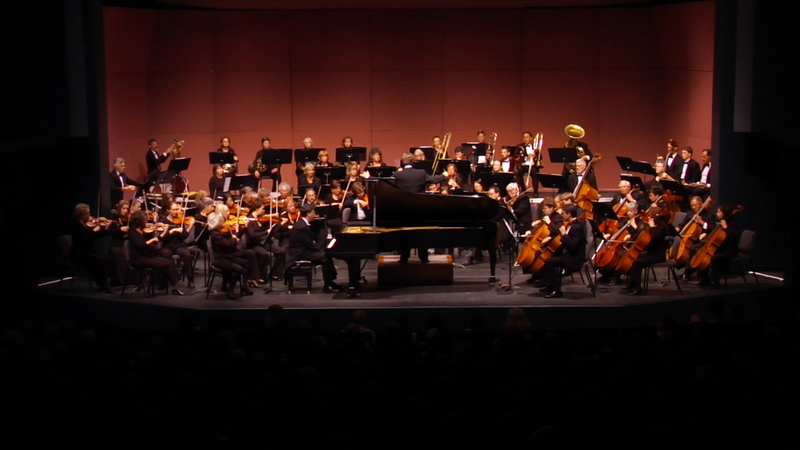 We begin the climb back up to Canada tomorrow as we hit the road for Oregon for the Rogue Valley symphony orchestras performance featuring Keith Emerson's Concerto #1.